Tornadoes are capable of serious destruction. What gets them twisting? Where do they get their energy? How can we protect ourselves when a tornado is approaching? 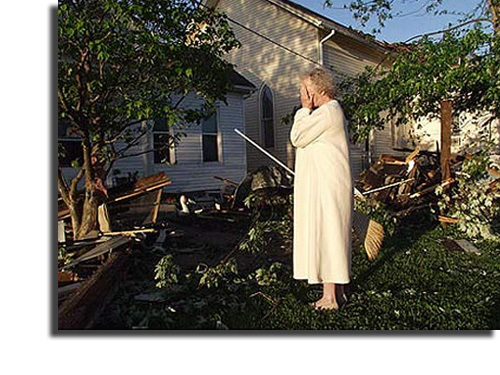 Darlene Young reacts to the devastation around her house in Pierce City, Mo., Monday, May 5, 2003, the day after the town was hit by a tornado. Young says her house was spared destruction by a church next to it that took the brunt of the winds. Where is Tornado Alley? What causes its unique tornado activity? What are the conditions necessary to start a tornado? Where is a safe location during a Tornado Warning? What is the ultimate source of the energy that drives a tornado? Make a tornado! Using only 2-liter bottles and some duct tape, try the tornado-in-a-bottle activity shown in the Why File’s very own tornado article. The Exploratorium also shows you how to do this.